Researchers have known for years that reading to infants as young as six months is crucial for language development, and that parents who consciously babble with their babies accelerate language learning. But they haven’t been sure what it is about reading to infants that helps develop language. 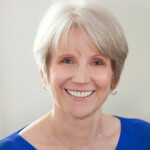 Julie Gros-Louis, psychologist at the University of Iowa, decided to look at specific behaviors of parents while reading to their babies compared to playing with puppets or toys to see what the parents were doing that may be leading to better language outcomes for the children. Many new parents are told that they should be reading to their babies, but what is it, specifically, about reading that helps in language development? Is it simply the reading itself, or is something else going on? 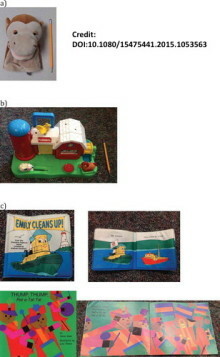 The study looked at how mothers responded to their 12-month olds during a variety of activities: a) playing with hand puppets, b) playing with toys, and c) reading books with bright pictures and simple sentences. They used mothers rather than fathers simply because interactions between mothers and babies have been studied more than fathers and babies so the research team could more easily compare findings to past studies. The researchers discovered that babies made more speech-like sounds during reading than when they were playing with toys or puppets, and mothers were more responsive to the baby’s sounds while they were reading than with the other activities. Gros-Louis suggests that this interaction is what leads to better language development in young children. This sounds amazingly similar to the results in the music study described in the last post. Infants in both language and music studies were tested at the same age (12 months), and both studies involved interaction of babies with parents. In the language study, the infants were not only listening to the story, but were also responding verbally to the parent and having their verbalizations answered. In the music study, they were singing, moving, and playing instruments together with parents. With both language and music, it appears to be the interaction between baby and parent that leads to music development and to language development. Perhaps the similarities between these studies aren’t so surprising. Aniruddh Patel, a neuroscientist at Tufts University whose work focuses on music and the brain, argues that music and language share deep connections in the brain that can be studied by comparative research. 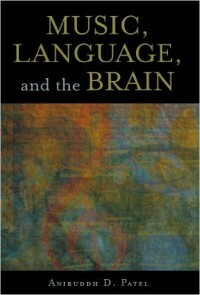 He won the 2008 ASCAP Deems Taylor Award for his book Music, Language, and the Brain, in which he suggests that, not only do music and language share a number of basic processing mechanisms, there are also more cognitive and neural similarities between the two than there are differences. So language and music seem to be related, and interaction with a parent is key to both language development and music development. So what is it about the interaction itself that helps children learn? Researchers at the Institute for Learning & Brain Sciences (I-LABS) at the University of Washington looked at social behavior of babies during language learning interaction and discovered that an early social behavior called gaze shifting is linked to the infants’ ability to learn new language sounds. Gaze shifting, when a baby makes eye contact with parent or caregiver and then looks at the same toy or object that the other person is looking at, is one of the earliest social behaviors demonstrated by babies. In the I-LABS study, babies of 9 ½ months from English-speaking households had four weeks of tutoring sessions with a Spanish-speaking tutor. The tutors read books in Spanish and played with toys with the babies while speaking in Spanish. Researchers counted, both at the beginning and end of the four-week tutoring sessions, how often the babies shifted gaze from the tutor to the toys. At the end of the four weeks, the babies were brought to the lab to see how much Spanish they had learned. They listened to a series of language sounds, both English and Spanish, while wearing an electroencephalography (EEG) cap to measure their brain activity. The results? The measured brain response was linked to how often the infants had visually tracked the tutors and the toys. The more gaze shifting that the babies had done during the tutoring sessions, the greater the brain response was to the Spanish language sounds. According to the researchers, babies contribute to their own learning, they aren’t passive. Social behaviors are giving them helpful information as they learn, so interacting with them is crucial for learning. Babies actually show the parent or caregiver when they are ready to learn – when they are paying attention – by gaze shifting. It seems so simple, and yet it has such tremendous implications. Click on the photo above to see a video from the study, and if you want to see an example of learning in babies based on a different kind of social information, watch the video clip following the gaze-shifting video, titled “Toddlers regulate their behavior to avoid making adults angry,” also from I-LABS. It’s sobering – in fact, frightening – to see the impact that anger has on a 15-month old. Although gaze shifting wasn’t specifically a part of the interactive music study described in the last post, it’s difficult to imagine that babies could be playing with the same musical instruments as their parents and not shifting their gaze between the parents and the musical instruments. And if so, that would illustrate some basic similarities between language learning and music learning, as Patel suggests. Let’s compare music and language in another kind of situation. Although there may be links between language processing and music processing in the brain, it seems that babies become distressed much faster when listening to language than when listening to songs – even when the song is from a musical culture different from their own. Isabelle Peretz, neuropsychologist at the University of Montreal, wanted to see how singing and speech affect an infant’s emotional self-control. In her ingenious study, 7 – 10 month-old infants from French-speaking households in Montreal listened to recordings of baby talk and adult speech in an unfamiliar language (Turkish), and then listened to play songs, also in Turkish, until they showed what is called “cry face” – lowered brows, lip corners pulled to the side, mouth opening and raised cheeks – universal facial expression for distress in infants. When listening to the Turkish songs, babies remained calm for an average of 9 minutes before showing a “cry face.” For speech in Turkish, whether baby talk or adult, it was only half as long, about 4 minutes. Then the researchers used a different set of infants to listen to recorded speech and songs in their native language, French, and found the same results – the babies listened longer to the French songs than to French speech, although the babies listened to only six minutes of French songs compared to nine minutes of Turkish songs. OK, first of all, it’s extremely interesting that babies will remain calm longer when they are listening to music than when listening to speech. But what’s fascinating is that they listened longer to music from another culture. Yes, nursery rhymes or play songs throughout the world have a certain similarity in terms of intervallic structure, amount of repetition, and lack of complexity. But that doesn’t explain why they listened longer to Turkish songs than to French songs. But perhaps the answer comes from another branch of brain research – learning and memory. Researchers in those areas tell us that the brain pays attention to novelty and to what’s new, which is why endless repetition of something isn’t the best way to memorize. The brain stops paying attention when it hears something too many times. So maybe the babies were just more interested in the music that was new to them. But that makes me wonder – at what point do we begin to prefer music that is familiar, as most adults do, rather than music that is unfamiliar – and why? That would be another interesting study. Very interesting that children listen for longer to music from a different culture. Maybe this is because they are at the developmental stage of striving to make sense of sounds and it takes longer to assimilate the unfamiliar. Paradoxically, very young children seem to particularly enjoy listening to stories they have heard before but then appear to grow out of this and prefer new stories. I wonder if you know of any statistics that indicate to what extent adults tend to prefer listening to familiar music, Lois. Thought-provoking comments, Sandy! Thanks for writing. Your idea about why babies may listen longer to music from a different culture is very interesting and makes a lot of sense. But it’s also true that young children like listening to their favorite songs, so somewhere between that earliest preference, like in this study, and just a couple of years later, children’s listening preferences change. I don’t know of any statistics about adults listening to familiar music. That was just my observation – people go to orchestra concerts to hear music they know, not to hear something new. And everyone has playlists on their phones or iPods/iPads with their favorite music. But I always like that the best of these brain studies bring up such interesting issues to think about.